Cloudtalk is the counselling and coaching practice of Sandra Hewett, based in Bookham in Surrey. She works from her home in a dedicated room – an informal and confidential setting. Sessions are face to face or by Skype. Counselling and coaching are similar but not the same: they are intended for different situations with different processes. However, there is some crossover between them. When counselling clients feel ready to find solutions, they appreciate that Sandra can offer a more practical, forward-looking phase. And her coaching is based on the belief that a healthy emotional and personal life is a base on which coaching succeeds. Her core practice approach for both is person-centred, which is based on the premise that the client knows their thoughts, feelings and beliefs best. You are able to deal with what life throws at you but sometimes you need support and a guide to work through things. So, you co-create the plan together, setting your own goals. Sandra is a supporter of and cheerleader for her clients, believing that everyone can find a way of living happier and more fulfilled lives, whatever their circumstances or experience. She helps people suffering depressive episodes, anxiety and relationship difficulties. 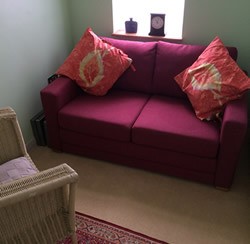 Her specialist counselling field is fertility counselling and she sees couples and individuals referred from two Surrey hospitals, as well as those who refer themselves privately. She also sees teenagers and young people who have a level of anxiety that stops them from enjoying life. As well as seeing individuals she goes into schools with a resilience-based course, Bounceability. Her original career was in marketing and public relations and she founded her own public relations consultancy in London, running it for 20 years. She then gained a Foundation Degree in Humanistic Counselling from the University of Greenwich in 2011, and a Coaching Certificate from Coaching Development (accredited by the International Coach Federation) in 2008. She is now an Accredited Member of the British Association of Counselling and Psychotherapy (BACP) and a Registered Member of the British Infertility Counselling Association (BICA). She follows the BACP Ethical Framework and clients have access to its complaints procedure if required. She also holds the relevant insurance. If you would like to find out more about Cloudtalk Counselling or Coaching, then please phone or email Sandra and arrange a time to talk on the phone, free of charge.